You may have heard the words, “realtime court reporting services,” thrown around before, but what exactly is it? Let’s define this so that it is the clear definition for what a client would use, this being a lawyer in a discovery, deposition, members of a board hearing, or a judge in a trial. The simple description of realtime reporting services is the ability for a lawyer or attorney to be able to view the live testimony on a laptop or tablet as it is being written by a court reporter. But let’s look a bit further at this and ask, Why would I use this? Why would I not just wait for the transcript to be delivered or just get a rough file at the end of the day? Do I need realtime services for my upcoming file? Why use realtime court reporting services? Did you know that hearing, and reading, the answers from a witness provides better understanding of the testimony. This can help you to focus on what a witness may not be comprehending and continue to review that area further. You can add a quick mark to the live evidence as it is being said, right on the screen. A quick mark is akin to adding a highlight mark to a page of the transcript to come back to later. This makes it easier for you to focus on the answers given instead of writing notes. You can also search these quick marks during the testimony or at a break to check on things that you may want to explore further. IR generally suggests using realtime court reporting services for proceedings that are lengthy so that your evening preparation time is reduced or the examination has a matter of urgency associated with it, such as an application to the court the next day. This way you have all the information as it happens, live, instead of waiting until the end of the day to review a rough draft of the transcript or waiting longer for the certified transcript to be provided by the court reporter. What do you need? Today, IR makes it so simple to use our realtime court reporting services. 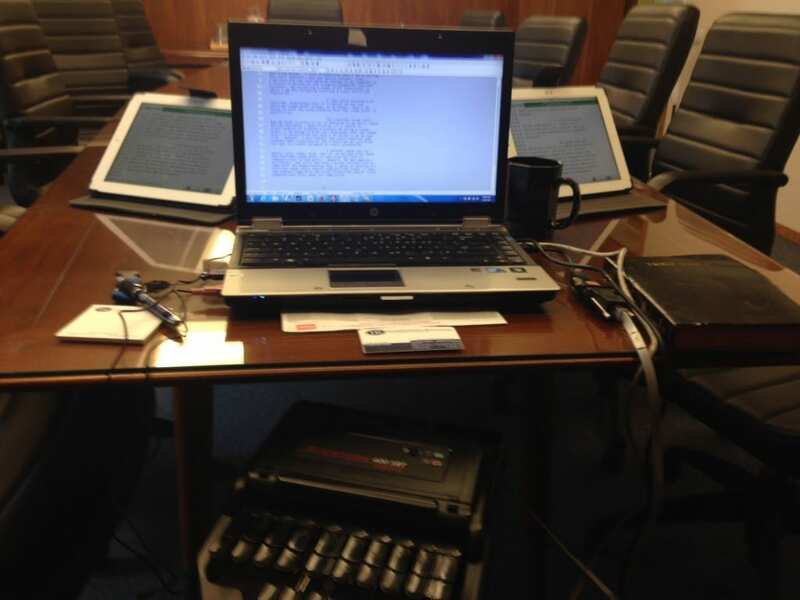 We currently have three of our court reporters that are set up to provide realtime at any discovery. They are equipped with iPads already loaded with software. Or, if you have your own laptop or tablet with you, you can easily connect to our own wireless connection with the reporter. Receive the access to our wireless router, open your browser, enter the URL your court reporter provides and in a moment you will have realtime streaming right to your own device. No software, no wires.